Interactive High-level Optimizing Parallelizer is a parallel program development tool based on the automatic analysis and transformations of sequential programs. 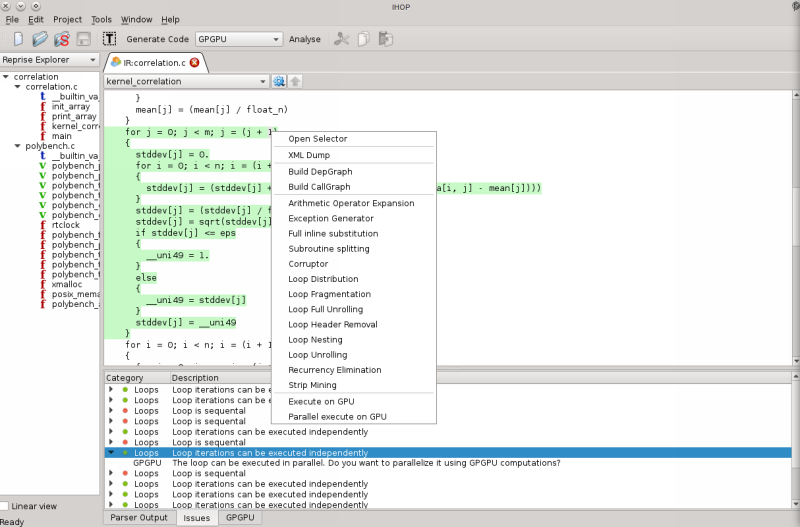 It supports multifile projects, generation of OpenMP and CUDA code. IHOP project is a new approach to the portability problem of parallel software. The essence of this approach is that libraries are not developed parallel, but admit the automatic analysis of information dependencies and efficient automatic or semi-automatic parallelization. When new computing parallel architectures appear, we should only add a new generator module to IHOP, focused on the new architecture and re-convert the library by IHOP. IHOP uses new and advanced methods of program parallelization. The IHOP development team uses Test Driven Development, enhancing the reliability of the developed software. The work was supported by the Russian Federal Program "Scientific and scientific-pedagogical personnel of innovative Russia", contract N 02.740.11.0208 from July 7, 2009.